This month’s event was about taking the static out of static websites and creating dynamic, rich experiences without sacrificing performance or security. You’ve heard the term “serverless”, you may have tinkered with AWS Lambda, but now let’s put our static site to work with a custom API that we don’t have to worry about servers or scaling. We’ll learn how to wrangle all our code in an end to end development workflow with the Serverless Framework, the most widely-adopted toolkit for building serverless applications. Sergey Chernyshev is going to talk about the reasons why we prefer generation+deployment workflow to calculating output in real time as users request information. We will review the difference between generation and caches and why the former is more preferred strategy while latter is often misleading with it’s declared ease of implementation. And in the end we will look at the range of currently available solutions, from static generation to API-driven applications within JAMstack and introduce a new concept of “Dynamic Generators” and discuss how one can build a system that combines benefits of “generation” workflow and “dynamic” data to help expand fast User Experiences all the way across the full range of web application. 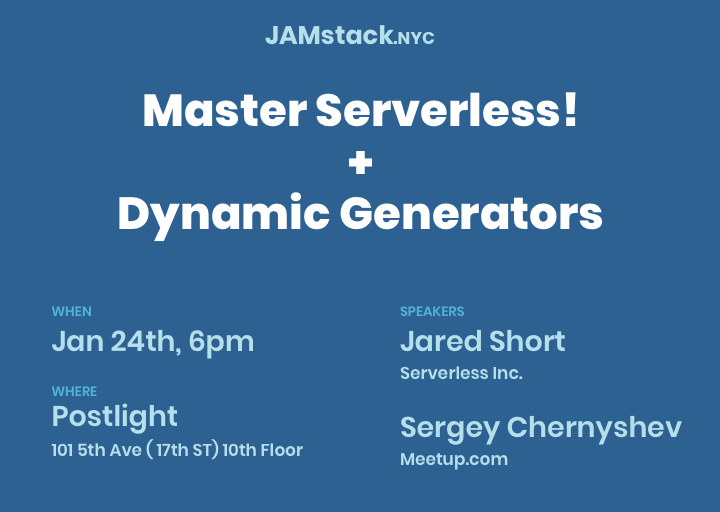 Jared Short, Head of Developer Relations and Experience at Serverless, Inc., and is based in Washington, DC. He comes to the company with a strong background in and building, operating and maintaining serverless and event-driven systems in his previous role at Trek10, a serverless first AWS partner. Sergey Chernyshev (@sergeyche) is web a performance enthusiast, open source hacker and web addict. He works as a principal engineer at Meetup and organizes New York Web Performance Meetup Group, local community of web performance geeks in New York and helps kick-start local groups about Web Performance around the world. Sergey teaches a live on-line course about performance with O’Reilly and often speaks on performance-related topics at various local New York events and global conferences, including Velocity and QCon. We were hosted this month by our friends at Postlight (https://postlight.com/) and sponsored by Forestry.io, a Git-based CMS, and Netlify, An all-in-one workflow that combines global deployment, continuous integration, and automatic HTTPS. And that’s just the beginning. *Good for Gold, Silver, and Bronze passes only.